In some cases, backgrounds can add to an image, but many times, they will draw away from the subject of an image and will need to be removed. Sometimes, you’ll want a white background, a unique-looking background like a desert or forest, or you’ll want to create a .png image for versatility. These days, many online retailers go with all-white backgrounds; in fact, it’s becoming the standard for many product images because white brings focus to the product. To remove the background of a product, mask out and take extra care of edges as well. To remove the background, took path inside of the object. And place into a new background. To remove the background from a product, Cut it out and made Transparent to set into any background. There are several techniques to remove a background from the image so that your images are more refined, and at Pic Buz, our specialists can utilize several in order to provide you the best possible images. To start, we’ll need to know what your needs are; background removal processes can be very different depending on whether you simply want to add a white background or transpose your subject onto a new background. Also, are you going to be enforcing a background color policy like those used on platforms like Shopify or Magento? Sometimes color is a major driving factor for your customers, which means that you may have to really consider the color background options for your image. 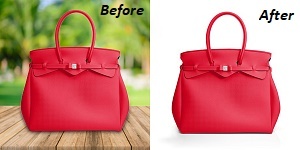 When you need background removal, one of the key tools that we use is creating a clipping path using Photoshop. Utilizing Photoshop’s Pen Tool, our designers will remove the background from your image entirely. Our team will use anchor points in order to ensure that the edges of your clipped image maintain its shape once the background is removed. Additionally, if there are fuzzier sections like hair and fur, our team will use masking in Photoshop to ensure that none of the individual strands are lost when the background is removed. Work like this should be done by hand. This is why Pic Buz’s designers are so impressive; we don’t use automated software-based processes to remove backgrounds because, in our experience, this usually results in less accurate images. We can do any background removal job using Photoshop; we have no issue with the scale of any project. We consistently are improving and our team has collective decades of experience. Let us know what kind of background removal you need, and we’ll walk you through the process. Contact us. TEST THE QUALITY OF OUR PHOTOSHOP BACKGROUND REMOVAL SERVICE! we are dedicated to quality image editing and our team is filled with talented individuals that understand the technology and can provide you with top-notch images in an efficient manner.